Joshua Barker is an Associate Professor of Anthropology at the University of Toronto and the director of the University’s Ethnography Lab. The Lab was launched in 2014 as a place to collect and communicate ethnographic research with the university and the public. Barker runs the Kensington Market Research Project, an initiative that aims to assemble a detailed knowledge base on one of Toronto’s most unique and dynamic neighbourhoods. 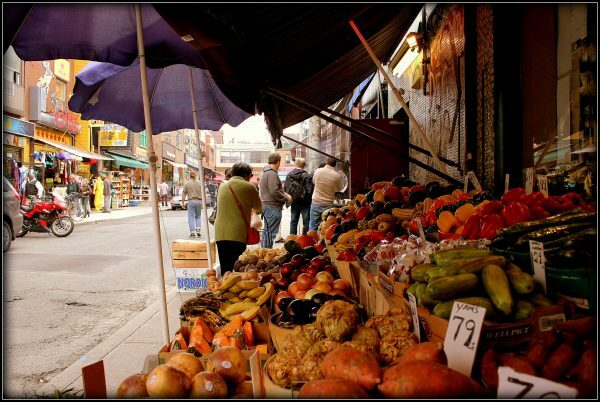 Kensington Market, which was designated as a National Historic Site in 2006, has an evolving history as an epicentre for immigrant communities and counter-culture. 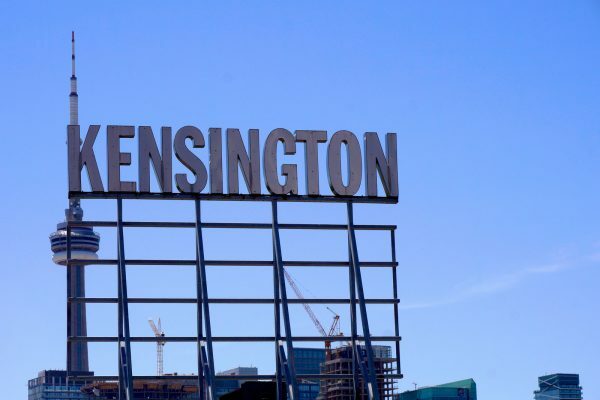 However, the neighbourhood is being impacted by the development and gentrification forces that are changing the face of urban neighbourhoods citywide. Spacing: How did this project originate? Joshua Barker: The project originated when we started the ethnography lab. When we started the lab, we wanted to do a research project that we could continue over the long term and one that would involve undergraduate students, graduate students, and faculty members. We wanted to do research on an interesting neighbourhood that was close enough to campus for students who commute to be able to do their own field research there. Kensington Market was just too perfect for that purpose to pass up and so we have gradually been developing some partnerships with community groups there and just learning more about the neighbourhood over the past few years. It started a couple of years ago, in earnest, when I ran an undergraduate course in anthropology, which had about a dozen students, and for the whole course all we did was focus on research on Kensington Market. So that was when it really began. Spacing: What are the most common issues or challenges that arise when doing research within the community? Barker: I think the biggest issue that we’re facing is probably over-saturation. Just in the sense that it’s a neighbourhood that draws a lot of attention. It draws media attention, it has a lot of tourism, both domestic and international, and it draws a lot of research attention and student attention, so you see high school groups coming through all the time. For certain key members of the community, the people who are more outspoken and who have been more involved in organizing, at times, they can feel that there is just too much; there are too many people who want to learn about it and they don’t have enough time to do their actual work. We are sensitive to that concern and we try not to overburden people there. So I think that is a challenge. The other challenge we face is linguistic. In ethnography we try to do a kind of research where we use the forms of communication and the languages of the people we are studying. As it is very well known, the neighbourhood is very diverse and that means a lot of different languages. One of the things I have been thinking about, and we have started finding some partial solutions to, is how we can get access within the University of Toronto student body to a wider range of students who have different language competencies. I did have a student who used to live in the Market and is of Portuguese background, so he was really good at being able to plug into the older Portuguese community there. We have done some [outreach] with Vietnamese residents in the Market but there are other communities that we haven’t been able to touch and I see that as our limitation. That is an area where I would also like to work harder. Spacing: Have you encountered any surprises when conducting research? Barker: I grew up in Toronto and so I have been familiar with the Market as someone who goes there occasionally before moving into the neighbourhood. There have been a couple of things that has surprised me. One, is the importance of the social service organizations that were there very early on — in the 1920s period of large migration. Just how important those services were in establishing a sense of community and a sense of social responsibility for the community more widely. I think the legacy of those institutions is quite tremendous for the Market. Another thing I see is, though there is a lot of talk about and factually you see a great deal of gentrification going on — I see more and more — the neighbourhood is really under pressure from all four sides. But despite those pressures, I think it’s really important that we also understand that this is still a very socio-economically diverse neighbourhood. Sometimes you don’t really see it in the representations of Kensington Market because there is a lot of focus on the cultural and ethnic diversity and even on the cultural diversity beyond ethnicity and race, but just in terms of economic class you see it. You see it when you have a fire in a home and realize that that home has housed dozens of people in very small spaces. You see the challenges that many people are facing in the street. I think it’s easy to get carried away with the concern of gentrification and to lose sight of the fact that there is a lot of poverty in the neighbourhood and that poverty needs to be recognized and addressed as well. Spacing: What involvement has the lab had with the groups that are deeply involved within the community, for example, Friends of Kensington Market? Barker: Ever since we’ve started having an interest in the neighbourhood we have been in conversation with Friends of Kensington Market (FOKM). When we have had neighbourhood events — such as a scan-o-thon where we were asking the public to contribute any historical documents they have on Kensington market for a digital archive — it has been done in collaboration with FOKM. Until now, the relationship has been strong and we have been in conversation, but it still has been quite preliminary. Our hope now, and what we have started conversations about, is to start moving to a collaborative research model where we would allow some of the community groups to help define what the objectives of the research are so that we can perhaps give research capacity to groups which themselves, have a certain amount of capacity, but they might not have as much as we have, to learn more about the issues that matter to them. I think that it would be really good for our students as well, to work closely with people who have their own clear objectives, such as community development objectives, community building objectives, and to learn more about what it means to work with a partner on research instead of just following what you think your professor wants. I think on both sides it could be beneficial but that will be the next phase that were moving into. Spacing: What do you predict will be the impact of the neighbouring Alexandra Park redevelopment on Kensington Market? Barker: That’s something that I’m very interested in personally and I have a PhD student who is actually here now who just completed her doctorate working on the Regent Park transformation. She studied the whole process of relocation, and moving back, and she studied the people who purchased condos in Regent Park, sort of what their social aspirations were for the neighbourhood and so on. I have a sense of how that kind of massive redevelopment can impact a neighbourhood like Regent Park in that case but I don’t think necessarily that it will be all that different in the Kensington case. Just spatially, if you think about it, the way that the neighbourhood has been constituted has been partly dependent on a lack of flow, both if you think about moving westward out of the Market, that Bathurst Street corridor really has no through streets, you need to go either up to College or down to Dundas in order to go though. That cuts down on a certain kind of movement across and through the Market. The same has been true in the north-south direction. So many of the streets dead-end on Dundas. I think one of the biggest impacts, and it will depend specifically on how they do the development, is a lot more through traffic. I think the connections between what is happening on Dundas West right now, west of Bathurst, with the designer and restaurant businesses that have been opening up there, could then flow through along Dundas more and it will also connect more easily down into what is happening on Queen West. 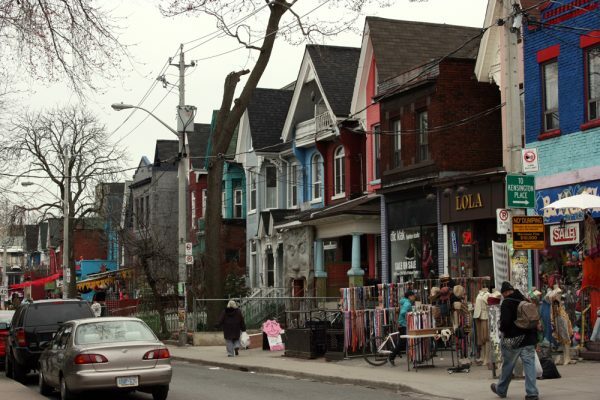 I think the sense of Kensington Market as an enclave, even if it is a bustling enclave with a lot of movement and diversity, it’s not an ethnic enclave but it is an economic enclave in a way, I think that could loosen somewhat. But I think the movement to pedestrianize and the density in the market might mitigate some of those risks. Of course you’re going to have a demographic shift, and you’re already seeing it with the new condo and Independent City Mart Loblaws subsidiary on College street and the new building going up on the south of College, east of Spadina. There are just a lot more residents coming into the neighbourhood. That will have some impact. The area at risk is probably on the southern side of the Market, which has historically been the less developed, and housed more Chinese and Asian ethic communities. I think that the development will have a pretty big effect on what the Market is, but it will probably take some years for that to happen. Spacing: What has the impact of the new Loblaws store and two high-density condominium buildings had on market residents and businesses? Barker: We don’t know yet. I saw an article, which interviewed several of the anchor business owners and consumers about it, and I visited the new Loblaws myself. So far, I don’t think it has had a huge impact. I think its more part of an ongoing change, as UofT’s impact is starting to push west along College, and UofT has a larger proportion than ever of international students and they will be looking for residences nearby, so they may be moving into that condominium and shopping at that Loblaws. 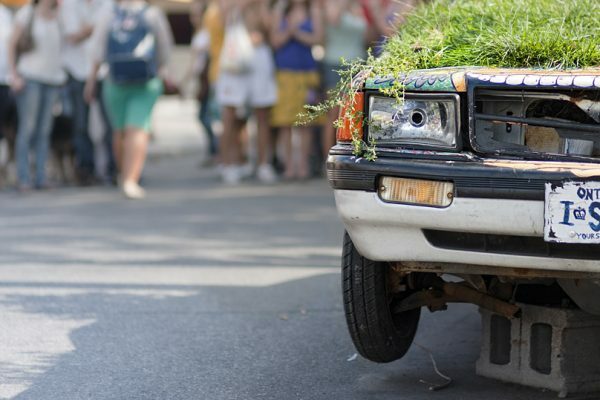 I tend to share the perception that many of the business owners in the Market have — it’s probably not going to have a huge impact on many of the businesses, but I think some of it will. You already see a for-lease sign in Freshmart and I think that really, in time, it is closely correlated to when that Loblaws opened up. That’s an obvious impact. I think that [the Loblaws] will be more for evening consumers, more for the office people who live in or near to the Market, who have trouble doing their shopping during the day, they will start doing more of their shopping in the evenings at Loblaws. Perhaps that will diminish some of their consumption on the weekends. Just from an economic impact, I don’t think it’s going to be terribly disruptive but I think for any business, when your going up against a larger competitor, will be more difficult. In terms of the neighbourhood, I think the Loblaws and condo building could be a lot worse, just in terms of how it looks and how it fits in the Market as a kind of structure. Although almost the whole market is very low-rise and the new building really stands out, it has a kind of sculptural quality to it; it has colors along one side and a big green wall on the back. They’ve integrated it with the affordable housing next door. I think it’s done fairly well, although it may raise some challenges, and it will undoubtedly contribute to the gentrification push that you can feel coming down Augusta from College, I still think that it could have been a lot worse. Spacing: Where do you see this research going in the future? Barker: Our idea is to take this project and start thinking a decade out. We see it as one long-term research project where we’re going to create an archive of data on the Market that will include interviews, field notes, photos, and found objects. We will have different generations of students passing through and contributing their own little piece to the project. How do I get in on this fun? Bet I could give them some pointers on research methods. Why bother wasting all that time sniffing out insights when you can just plop yourself down on the patio at Ronnie’s and let the gossip come to you… Amateurs!